You are your reputation. There are many ways to improve your reputation. In my opinion, you want to be intentional about what people say about you…and your work. To improve your reputation, you have to know what determines it. My guest today AJ and Rory Vaden, the founders of The Brand Builders Group. We talk about the power of reputation and how to improve your reputation. We talk about why it matters so much. Tune in to discover how to improve your reputation. 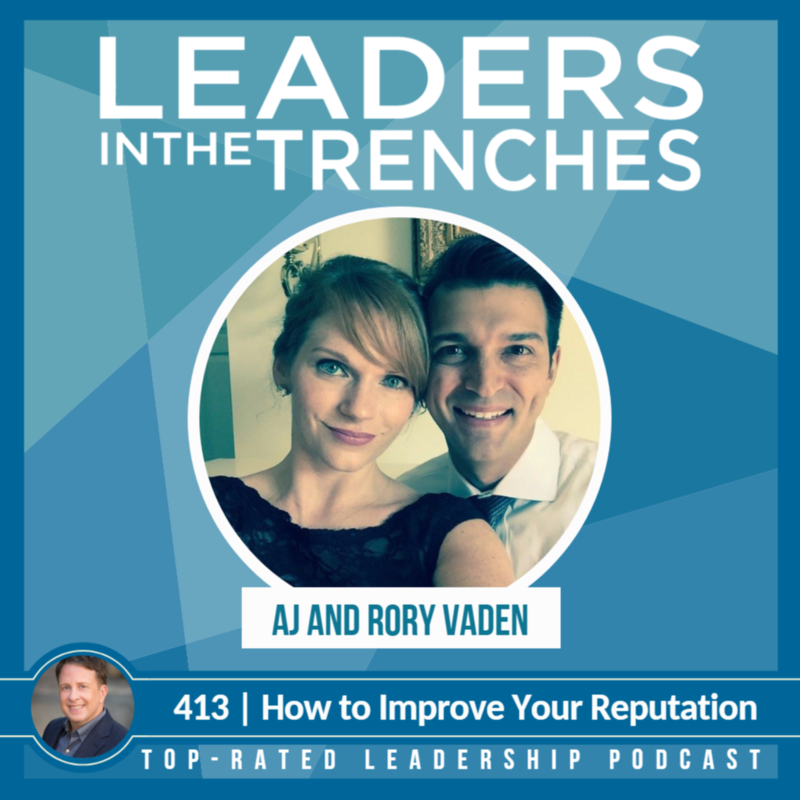 Target Audience: Rory & AJ Vaden are spouses, entrepreneurs, and co-founders of Brand Builders Group. A brand strategy firm for influencers & entrepreneurs looking to turn reputation into revenue. Gene Hammett: Hi, my name is Gene Hammett. I am the host of leaders in the trenches. My question for you today is what does it take to improve your reputation? Improving your reputation is something that you probably don’t think about very much unless, uh, you need to improvement. But what if your revenue reputation was directly linked to revenue that you’re creating in your company? Think about that for a second. There’s a big movement inside of all marketing toward building a personal brand, building something that individual people can relate to. And we’ve got a special guest today, actually two guests. We have AJ and Roy Vaden. They are, um, partners and the business builders group, but they also really focus on helping people understand and how to leverage their brand and the reputation to the next level. So that is just a snapshot of what we’re going to be talking about today. Gene Hammett: We’re going to uncover some of the core aspects of that. He’s got a formula that we’re going to share about what really impacts reputation and what that means for you as a business owner and what kind of content can you create and how you create it in such a way that makes you more reputable to those that mean the most to you. So that’s today’s interview. We are with AJ and Roy Vaden. Roy is the author of “Take the Stairs” and “Procrastinate on Purpose”, both great books, uh, in their own right. This topic today is a little bit different than that. I think we do bring up those books, but really want you to zero in on how to improve your reputation. So without further ado, here’s the interview with AJ and Roy. Gene Hammett: How are you guys doing? This is Gene Hammett and leaders in the trenches. Rory Vaden: Hey Gene, thanks for having us. It’s good to be here. AJ Vaden: Wow. Are, we’re happy to be here. Gene Hammett: Well, we have Roy Vaden and Aja Vaden. We’re going to talk about, um, something that we all have, whether you know it or not, putting much thought into it, a reputation. So before we kick off, I always ask the guests, tell us about you and who you serve. AJ Vaden: Yeah. So, uh, we are the co-founders of Brand Builders Group. And so basically we specialize in helping people build and monetize their personal brand and in terms of our business, but we study reputation strategy and what is a reputation? How do you actually create a reputation? Why, uh, why are some people’s, you know, better, bigger, stronger, faster than others. But you know, we work a lot with kind of it entrepreneurs, influencers, speakers, authors. That’s, that’s kind of our core, our core group. Rory Vaden: Yeah. But one of the things that we find is that regardless of what category you fall in, entrepreneur, business leader at your corporate executive influence or author, speaker, that you’re really in one of two buckets and us really kind of serve two audiences. The first audience is that group of people who have really big online social followings, they’re not really quite sure what to do with those people. They don’t really have a way of monetizing that or creating a service that would appeal to this amazing following they’ve created. So that’s one category. The second category are those individuals who have built an amazing business, but they haven’t established the reputation or the audience or the online following to grow the business and the way that they want. So one following, not the business, the other has the business and not the following. Gene Hammett: Well, I, I love the conversation because we all have a reputation whether we think about it or not. So why don’t we get on some common ground here? What, what is our reputation in the terms that you guys think about it? Rory Vaden: Ours is a really simple definition. And what we believe is that a reputation is simply what people think of when they think of you. AJ Vaden: As sort of a reputation it’s an assessment also of your trustworthiness, right? So that it’s like when they hear Gene, what immediately comes to mind. And then also like what is the sort of strength of that, the trustworthiness or that integrity or that character. And, um, you know, so we kind of talk about both, both, both. Uh, you know, AJ mentioned this just moments ago. There’s sort of two parts of it. One is building a great read, like building great character and building a reputation. The other part is being known by a lot of people and those are two different things. Gene Hammett: Well, let’s take about those today. You know, creating a character that we are proud of and that we are building as one of the things I’m doing with my podcast, writing for Inc magazine, looking at how I speak and where I speak. Um, but what are the some of the things that you think about when you were talking about the building side? Rory Vaden: Yeah. So, uh, a do, why don’t you, why don’t you introduce the reputation formula and then I’ll kind of break, I’ll break down where, you know, the results part of that. AJ Vaden: Yeah. So we believe that any recantation, um, follows a really simple equation and it simply, your results time, you times your reach at your audience equals your reputation. So what results do you have, who knows about it? And that gives you your reputation. It can be very small, it could be very big, it can be very good, it could be very bad. But when we think about some of the results, um, you know, one of the things that we talk about all the time, it’s just, you know, let me just give you a couple of quick examples and I’ll kind of just walk you through this. So I’m going to give you some names and some people who I am sure that you know, and then we’ll talk about what are some of the results that they had and how that influences their reputation steps. When you hear the name Mother Theresa, what are some of the results that you naturally think of it? Don’t think of specifics. Just think, are they good or are they bad? Gene Hammett: Yeah, for sure. AJ Vaden: If it needs good, right? AJ Vaden: But here’s the interesting thing. Both of them are equally known, as you know, Adolf Hitler’s name as much as you know, Mother Theresa’s name. They just happened to be known for completely different things. One really good one really bad. So when we think about the results that really influence your reputation and that could be anything from your integrity to what are the things that you believe into your character traits such as your humility, confidence, your ability to serve, um, forgiveness. Those are like those intrinsic values that we talk a lot about. It’s like when we think about a personal reputation, forget a company but a personal reputation. A lot of it comes down to what we mentioned earlier, which is trustworthiness. That’s it. Are you a credible individual who we believe will do the right thing at the right time, regardless of their own self-interest? And then do you really have a credible result to back up what you say and then who can vouch for that, which is where the beach part comes in. Gene Hammett: I look, I love that, the simplicity of this, you know, the results times, um, reach equals the reputation when, when I think about that and you know, why use the times thing cause I know there’s leverage there when you have something that more people know about, but I want you guys to explain it to us. AJ Vaden: We’ve not seen earlier, we would not have a problem with me talking. So I’ll just do this really quickly and then I’m gonna pass it off to. But here’s the thing that I think is really amazing is that there are equally amazing people out there who are doing incredible things. And the reason that we picked multiplied versus add or anything else in this formula is that it does not matter how amazing you are, what good things you’re doing. If no one knows about it, you still can’t buy from you or help you or support you or promote you or be loyalty. You. And as many examples, as I have with people like Mother Teresa and Adolf Hitler, I have equal examples of extraordinary talent and good things going on. And no one knows about. So it’s that whole idea of anything times zero is zero and that’s where that reached part comes in. Okay. Maury, I will stop talking. Rory Vaden: Yeah, I mean its reach is a multiplier. Right? Um, so you asked that question earlier about how do we define results? You know, in Adrian talked about character, a lot of we take results and we break that down and we say your results is your character at times, your productivity. Um, our first book was called take the stairs and that was really about developing personal character integrity and all that stuff. Um, and then our second book was about multiplying your time, which is really about productivity. So when you look and you go, okay, that’s how you make a person’s results. What is somewhat disheartening and a little bit sobering to me, Gene today, is that we know a lot of people that have great results. Like there are people of quality and people of character and yet the world doesn’t know about them. And so there are all these other people who are like Instagram famous or their social media celebrities. They have a huge reach, but they’re not necessarily people of high character. That is a very sobering, uh, insight for me to go. Rory Vaden: We need good people to be more well known. And sometimes it’s their own humility that is, is sort of working against the idea of enhancing their reach. But reach doesn’t add reached doesn’t linearly enhance our reputation. It exponentially enhances its reputation. Um, and when you see a personal brand grow and some of our clients are, you know, fairly well-known celebrities, um, others of our clients are just really beginning out and they’re just trying to sort of either build a personal brand of, draw attention to their real business. Uh, or maybe they’re trying to, you know, build a career as a speaker, an author or something like that. But, but either way, like to what AJ said is, you know, offered too many people there reaches close to zero. And we really want them to understand that, uh, having people know about you is more than just like a nice thing. It’s imperative. It is a part of your reputation and if you’re an amazing person but nobody knows about you, then your reputation is, unfortunately, we, it’s weaker now. Your character is strong, your results are strong, but you’re in. Your influence in the world is unfortunately low and we want to, we want to help raise that. ADVERTISEMENT: Hi there, this is Gene. I’m the host of leaders in the trenches. I wanted to give you a free gift. I’ve been working with audible for almost a year now because my book published last year and I’ve been listening to audible books for probably three or four years. I really love it and I wanted to give you a free gift. 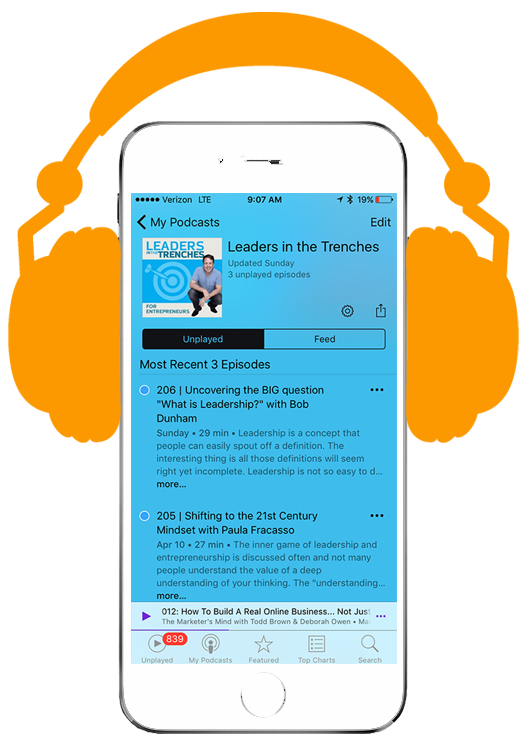 If you want a 30 day free trial of audible, all you have to do is go to audibletrial.com/leadersinthetrenches that will give you access to any book you want. You don’t have to buy the trap of success, which is my book. You can buy any book you want, so if there’s something you’ve been wanting to read, just don’t have time. Make sure you go to audible, audibletrial.com/leadersinthetrenches. All right. Back to the interview. Gene Hammett: Let’s focus a little bit on the reach side. Like so you already have a great result in your business. What are some of the things that you need to do first to think about how to expand our reach? Rory Vaden: Yeah, so, so on the reach side, we subdivided that also. Um, and we think of rage. This is, this is some, this is a, an important realization because we divide reached into two categories, direct and indirect. Now a lot of people who don’t have a lot of reaches, right? Because they’re not, you know, they’re not vain people. They don’t care to have a bunch of followers or whatever. So they haven’t spent maybe the time to build a personal brand probably like they should. They don’t have a huge direct reach. A lot of those people do have great indirect reach, meaning they have relationships with very influential people who have big platforms and big voices. And that’s something to not underestimate. So we do an assessment also of like who do you have relationships with? Because that does help tremendously, even if you don’t have a large direct reach. Now in terms of building direct reach, uh, I think, you know, maybe age eight you want to, you want to speak to that a little bit about some of the things we help people do there. AJ Vaden: Yeah, I mean I think a big part of expanding your direct audience has a lot to do with, I think one keyword, grass, which is consistency. So whether that is online or offline, it’s whatever you’re going to do. Are you doing it consistently? So that could be from social media posting to podcasting, to blogging, to speaking to writing articles rather than you’re a contributing editor somewhere or you’re just doing interviews as they come in. And then what are you doing to consistently be in front of your audience? So that’s it. That’s half the battle, right? Paper is just doing it more than one time or one time a month. And then the second is making sure that you’re reaching everyone on every platform. And we just find that it’s amazing to me still today, how many of our clients, even you have amazing social media following on a single platform. AJ Vaden: Don’t do anything else on the other platforms. Yeah. Got No clients. You have a quarter of a million followers on youtube or they have half a million followers on Instagram and do not have a linkedin account. They’re like, what’s the point of that? That’s just the business. And it’s just, uh, there’s so low vision of, well, this is just my platform. And it’s like, well, you know, there’s like 200 other million people on these other platforms that you’re completely ignoring. And I think a lot of that just comes to awareness of who is your target audience and where do you find them? And we find that most people don’t spend a lot of time focusing on who is my core target audience and where are they spending time and how can I access them there. Gene Hammett: Yeah. And I saw Rory speech at the NSA conference in July of 2018 fantastic job. Um, I just, I resonated with a lot of it, but specifically in April with this podcast, I wanted to increase the reach of and the message in specific channels. So we ended up doing a repurposing strategy where we took micro videos out of the interviews and we put them in Instagram. And we’ve, and I have never really done anything other than personal and I saw a huge increase and kind of impact that necessarily in large numbers, but just the way the brand was perceived. So it really does work. And I really, that’s one reason why I wanted to have you on the show today. Rory Vaden: Well, thank you for that. And you know, one of the big techniques that we teach people is what we call content and diamond. Um, and the idea is that you know, people get overwhelmed. An of people who have great results and high character that doesn’t have a lot of reaches, it’s because they’re hiding behind the excuse or the fear of I don’t have time or I don’t care, or I can’t keep up with all this technology, Yada, Yada, Yada. And yet this is such a simple thing that they can do that would multiply their influence. And so we teach them the content diamond, which basically says, look, all you should do is focus on creating one sort of cornerstone piece of content, one centerpiece. And if you do that on video, so like we’re doing this interview right now on video, then what you can do is you can, whether it’s a Facebook live video or an interview like a zoom interview is you can then take that video and you can run it down two separate tracks. Rory Vaden: One track is text and imagery. So what you’re going to do is you’ll have somebody go download the video, upload it to a tool like Tami or rev.com or speech pad and get it transcribed, send it to an editor. The editor is going to edit it into a code, coherent articles, and they’ll repost those articles on places like Linkedin, pulse platform or medium. Um, and then they’ll also pull out two or three catchphrases and turn those into images. So they’ll take those and they’ll just post them on some standard templates that you create as a part of your standard visual identity brand package. Put those on those and then you post those to Instagram and Pinterest simultaneously on a different path. That is video and audio. So you can take the video interview, Strip the Audio, upload that as a short form podcast, and then take the video and do exactly what you said. Gene Hammett: I really liked the simplicity that which you talk about these models. And, and I, I’ve been doing this if, you know, if anyone knows, we’ve been really focusing on the content that’s being created out of here because I in a lot of it’s just content idea with other people. Like I’m not even the expert here, Rory and AJ. Um, but it really does work. So I think you guys should pay attention to what he’s talking about. Um, my question here for you guys is this, when you think about a lot of people will dismiss social media these days because who has time for all of that stuff and who has time for this? I know there’s some value that you could share with our audience who goes, you know, why do I want to be on these channels? Um, what would you guys say to that? AJ Vaden: Yeah, well, I’m sure we both have lots to say on that, but here’s my take on it. But the way that things are going, it’s like social media is taking over traditional advertising. It has a more loyal following. It hasn’t worked custom following. It has a more engaged following. And we really believe that creating a personal brand is the future of marketing. You already see the trends happening now with the number of sponsorships that was standing in 2018 it was up $32 billion. That corporation spent individual sponsorships compare to traditional advertising. That includes anything from, you know, the social media influencers with paid posts paid ads and promotions and sponsoring products. It’s like that is where it’s going. If you look at TV versus radio and billboards versus the online spanned, it’s social media spend. It’s kind of that question of how could you think you couldn’t be on social media today? AJ Vaden: Yeah. And it’s, it’s just one of those bizarre things that we see. But I think the really cool and unique thing is that on social media, it’s the power of the person, not in the power of the company is the power of the person. Um, and that’s where the loyalty is established and the relationships are established. It’s like people are following people more than they’re following brands, which should get everyone’s attention. If you’re a business owner or an entrepreneur, a leader are anything that you, anyone that you need to influence someone else. This is a key platform to expand your reach and share your message. And it’s free until you start paying for ads. And boosting the platform itself is free. And it’s one of those things where it’s like this is going to give you the largest opportunity for engagement that there is. And it’s not something you can ignore. It’s not going away. It’s only growing and expanding. And it’s, it’s one of the things where anyone who thinks it’s a waste of time hasn’t spent any time on there in the right direction. And that’s the difference between using yeah. Yes. And using it for social. Gene Hammett: I want to add something to that AJ, you know, and, and I was just talking to a friend of mine, Marc Gutman and he mentioned, um, one aspect to creating content and creating this reputation and getting more reach would be around when someone gets to know you for the first time, maybe they get to know you online and they look at an interview or they look at an article you wrote or they look at something that you did months ago or years ago even. And that can precede you and many of the conversations like, you know, Rory, I’ve known about you for a long time and you know, your reputation proceeded me all the way. Never met because I knew the content you were creating. And that’s a big benefit that people are missing as when it comes to using these social channels. Rory Vaden: Absolutely. Yeah. The you know, when we work with people, gene, we take them through this four-phase process of like, you know, creating a personal brand, um, and, and kind of, you know, turning their reputation into revenue as we often say, whether it’s driving that traffic back to their existing business or creating something new. But, um, I think the signature framework of our phase two process, we call the relationship engine. And the reason we use that is that what we try to do around each of our clients is we try to create an automated ecosystem by which people around the globe, 24 hours a day, seven days a week, can be exposed to their ideas and their beliefs and their philosophies and their messages. And you know, there’s, there is, uh, you know, a very big empirical argument to be made for, you know, like with AJ was saying the business component of why you should do social media. Rory Vaden: Um, but even if you strip out financially and you just talk about the amount of influence you can have in the world and to make a difference in the world, you can have people finding out about you all day, every day and a completely automated fashion without you having to be there. So why wouldn’t you want to leverage that technology and those to be able to get your message out, even if you’re not trying to make money, even if you’re trying to just create awareness around something? But if you’re a person of high character, it’s probably because you believe deeply in some things and the world needs to hear what those are. And uh, yeah, maybe there are personal benefits that show up to you. But even so, just getting your ideas and messages out to the world. Uh, we’ve never, there’s never been a time in history when you’ve been able to do that and do it right from your phone. And it’s just incredible. Gene Hammett: So we’ve explained the power of reputation and what makes that up. And one of the things you do, you know, if anyone wanted to support through this, you have some, some different ways to engage with you. Can you share with us a little bit how you would work with someone like that? Rory Vaden: Uh, yeah, absolutely. Well, you know, the short of it is, um, we’d love to do is just talk to them, right? Like our favorite thing to do is to actually have a human conversation with people. Um, and so if anybody is listening going, gosh, I really do need to, I really do need to boost my social media presence, or I really do, I really should write a book. I do want to speak, right? I do want to get my message out. Or even if you have a company and you don’t have a desire to do any of that, but you say, Gosh, I wish I could, I could indoctrinate my team members more with my philosophies and if I could just use social media tools to indoctrinate my own team, my own employees, um, we’d love to just kind of talk to you. AJ Vaden: So if you go to GeneHammett.Thebrandbuildersgroup.com. So GeneHammett.Thebrandbuildersgroup.com. Uh, there’s a little form that they can fill out. They can request a call and talk to, you know, one of our, a brand strategist and we’d love to just kinda hear what they’re up to. And you know, that’s, that’s, that’s the only thing really I would say is just let’s, let’s get to know you a little bit. Gene Hammett: Well, I appreciate you sharing that. Um, I’ll put that link inside the show notes here if mean didn’t catch it, but, so basically GeneHammett.brandbuildersgroup.com. Uh, I really appreciate you guys being here and Sharon, so a new perspective beyond just, you know, these high-level words of reputation. Like how do you actually shape that, how do you, how do you let it benefit you and benefit the world as well. So I appreciate what you guys are doing and thanks for being here at leaders in the trenches. Rory Vaden: Yeah, thank you so much. I mean we just, we really appreciate it, Gene, and have respect so much for your work. And what you’re doing for the community. And um, I mean you’re, someone’s building a reputation, reputation precedes you and building a reputation we think at the end of the day is even more valuable than building a business. Gene Hammett: Well, what a fantastic conversation. I love doing what I do. Get to talk to these amazing people that are on the frontline in the trenches, so to speak about what they’re doing, how they’re doing it, and share that information with you so they are amazing people. Make sure you follow up with that URL, GeneHammett.Thebrandbuildersgroup.com Hopefully I got that executive right, but we’ll get that in the show notes. If for some reason you can’t find it, and as always, make sure if you have questions you can reach out to me. Ask me anything. I can share some of the experiences I’ve had with building my own brand, some of the mistakes I’ve made that journey and really just help you with anything I can. I’d love to sit. Sure. One of my audience members, if you’ve listed here one time or a hundred, I’d love to get to know you. So reach out. Let me know your question. As always, lead with courage and I’ll see you next time.